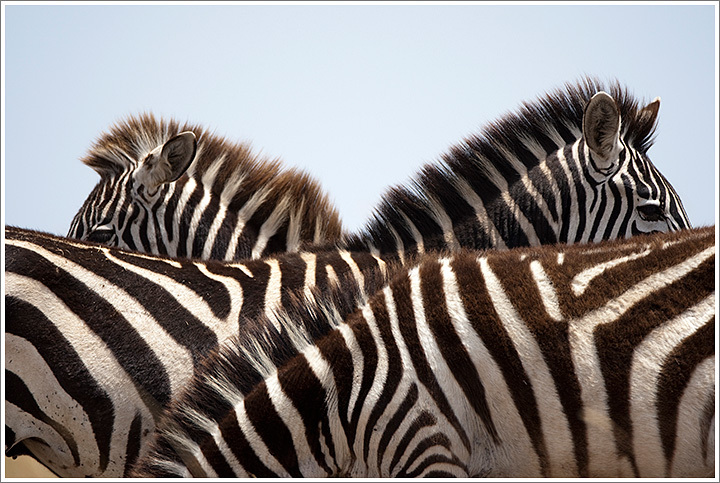 Compressed telephoto view of blending stripes of Plains Zebra (Equus burchelli) standing together on savanna. Photographed September 1, 2009 with a Canon EOS-1D III camera and 600mm f/4 lens. Exposure 1/1250 seconds at f/4. This entry was posted on Tuesday, September 1st, 2009 at 5:17 pm. It is filed under On the Road and tagged with Africa, Kenya, Masai Mara, Wildlife, Zebra. You can follow any responses to this entry through the RSS 2.0 feed.